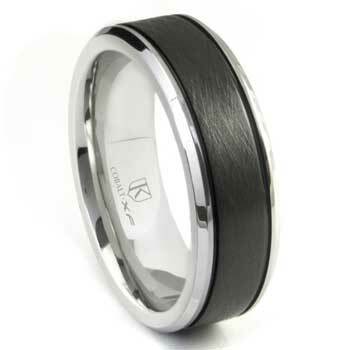 If you want a classy men's wedding ring then the cobalt xf chrome two tone di seta finish wedding bBand with grooves is the perfect answer. We have found that consumer interest in cobalt chrome has grown over the last few years. Cobalt chrome is very strong. Cobalt chrome is an enduring metal that is great for engagement rings and wedding rings. Why? Because cobalt chrome is a naturally strong metal alloy that does not lose much mass over the course of time. Our cobalt xf chrome two tone di seta finish wedding band with grooves is a great wedding band for white collar and blue collar men. It is rugged yet refined. It has a look of class and a contemporary design. The wedding ring is also a great idea for a birthday present, Christmas gift, graduation gift, or a nice present for graduating. As with all of our jewelry it is backed by our 100% lifetime warranty so you need never worry if it somehow should become damaged.